For several years now my inspiration has been the valley of Glengairn in rural Aberdeenshire and I am currently developing work that looks at the marks and scars left on the land – from heather burning to peat cutting. At present I am looking at the abandoned peat workings and how the distinctive layers trap remnants of past lives -skeletal, ferrous, fibrous. I am fascinated ,not only by the rich colours and texture of the peat but also its historical importance to a past way of life when it provided a source of warmth to an impoverished community. 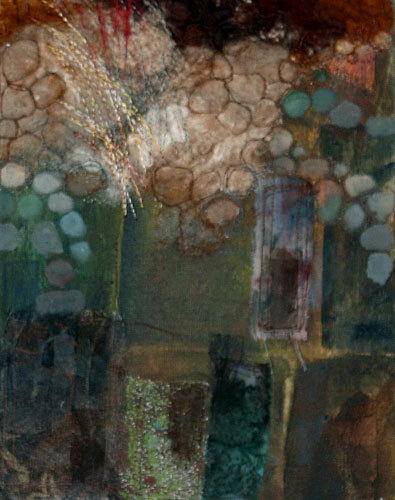 I usually work directly from my sketchbooks, paintings and occasionally photographs. 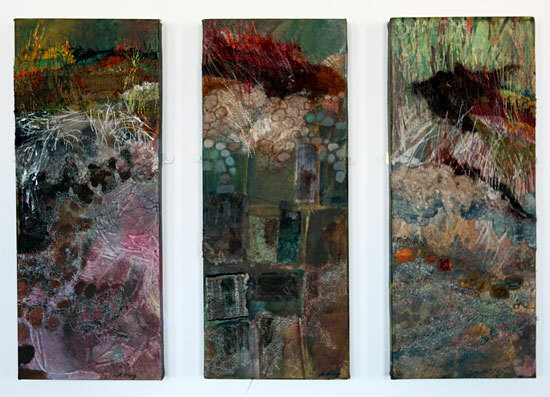 In the final pieces I use a wide variety of media including felt, stitch and paint.